Yesterday I posted on the Civil War Memory Facebook page an NPR interview with Noah Andre Trudeau that focused on Robert E. Lee and recent commemorative events of the Civil War. I didn’t listen to it straight through so I missed this little gem of a comment on black Confederates. It’s a bit disappointing given his work on black Civil War soldiers that I used throughout the research phase of my Crater study. This is from Jim in Birmingham: I’ll celebrate my ancestors in north Alabama who joined the First Alabama Cavalry USA and fought the slaveholders in Alabama and served with Sherman on the march to the sea. And Andy Trudeau, that reminds us: This is not a simple conflict. Mr. TRUDEAU: No. There are so many complex threads involved here. You cannot say something never happened. And right now, I’m a little concerned that there’s a polarization and that there’s groups that claim it was only about states’ rights. There’s another group that’s saying that it’s absurd to think that a Southern African-American would even consider doing anything to support the Confederacy. And they just block any effort to make mention of that, when, in fact, I don’t think you can deny that some of that happened. We’re talking small numbers, but clearly, this is a very complex community. There are bonds of intertwining trust and friendship between black and white that carry forward into the war. And it’s not unusual, I think, especially in some small units, to find African-Americans serving with their white – I guess you’d have to call them their masters. But it happened – not a lot, but it happened. It’s difficult to know where to begin with this brief comment. First off, I can’t discern whether Trudeau is referring to slaves or soldiers; this confusion is all too common in this debate. If he is referring to slaves than we are talking about large numbers that were present with Confederate armies throughout the war. Kent Masterson Brown suggests that Lee’s Army of Northern Virginia included thousands of servants and impressed men in the summer of 1863, who performed an array of jobs. As for “bonds of intertwining trust” I think it is safe to say that we are on much shakier ground. I have no doubt that the war probably brought master and slave together in close contact and I have no doubt that certain bonds were formed. The problem for any historian researching this, however, is that there is almost nothing available to help fill in the blanks. It should come as no surprise that I have yet to see a wartime account from a slave that references how he felt about his master while in the army. Working on my article on Silas and Andrew Chandler it is easy to imagine the two conversing about how much they miss being away from loved ones, but I don’t have access to one shred of evidence that might help me to better understand Silas’s perspective. If Trudeau is referring to soldiers than he is simply misinformed, which is unfortunate. I would have him talk to Robert K. Krick about the presence of black soldiers in Lee’s army. What Trudeau and most everyone else who enters this debate forgets are the legal “bonds” that defined the master-slave relationship through the war. Somehow what gets left out of this discussion is the fact that the armies reflected and functioned as an extension of a slave society at war. I would love to ask Mr. Trudeau and others whether they believe that “intertwining trust and friendship” defined slave life before the war. If not, then why are we so quick to assume it during the war? There are two fundamental points that must be acknowledged before entering this debate about black Confederate soldiers. White Southerners understood that their slave population represented an important wartime asset if they could be successfully mobilized. At the same time, it became clear early on that slaves did not support the Confederate war effort; at least this much is indicated by the many reports from around the South of increased tension between master and slave in light of what the latter viewed as a war that could lead to their freedom. As the war progressed these fears increased among slaveholders and the slaves themselves became more agitated as Union armies moved closer. At the same time slaveowners resisted every effort on the part of the Confederate government to impress their slaves into service and they did so based on their rights as property owners. They did not want the Confederate government threatening their sovereign control and they viewed such attempts as a clear sign of a government that had overstepped its constitutional bounds. Both of these crucial points are explored in great detail by Stephanie McCurry in her book, Confederate Reckoning: Power and Politics in the Civil War South . One of McCurry’s most important points concerning the debate about the recruitment of slaves as soldiers is that it came out of an explicit acknowledgment on the part of Confederate officials that they could not expect slave support without acknowledging these individuals as political agents. In other words, that the government took steps to recruit a few men at the tail end of the war, with promises of freedom, must be understood as a fundamental failure in terms of the assumptions that defined the master-slave relationship before the war. Somehow, we’ve got to move beyond the naive and overly simplistic understanding of the master-slave relationship at war that has now shown up on NPR. Thanks for this post and for your blog in general. I listened to the podcast for this program this morning, and I admit to being a little disappointed with it. There were a few too many sweeping statements, and the show seemed to lack some focus. I writing this as an avid listener to Talk of the Nation and other NPR programs, and I usually enjoy their work. Where can I find the Krick article? I’m assuming that it’s been published since 2007. Also, supporing your arguement before I’ve even read the article, you can’t even assume the “nonwhites” are necessarily black, since Native Americans and even some Asians, as some MoC staffers are fond of mentioning, fought for the confederacy. on the other hand, putting Trudeau’s interview aside (and again I realize that I’m throwing in my 2 cents before I even read the thing), don’t the numbers you reference from the Krick article bear out to some extent the assertion that, in rare instances, Blacks did fight as armed soldiers in the confederate army prior to the end of the war, and if so, isn’t that worth exploring on it own? You are asking excellent questions. First, if I remember correctly the Krick piece is unpublished but has filtered around among certain historians. That said, I’ve heard him say in person that claims suggesting significant numbers have no merit whatsoever. Yes, in rare instances we are bound to find men who for whatever reason managed to join and stay in the army. I’ve read of a few men who joined but were revealed as colored and forced out of the army. We should absolutely follow up and find out as much about these exceptions as possible. They are interesting stories in their own right and may tell us something interesting about the social profile of their particular unit. However, the crucial point is that we need to consider these cases as exceptions to the rule and not emblematic of the Confederate army as a whole. In other words, these special cases do not impact on our broader understand of Confederate policy toward slaves. As your former teacher I demand that you read Bruce Levine’s book, Confederate Emancipation, if you haven’t done so already. Nice to hear from you. Let’s get together for lunch next time I am in town. I do know there were African-Americans who served in some capacity or another in the PACS. But how many? An impossible number to find since, if they were properly enrolled in the Army, their presence was illegal and the enrolling officers were subject to dismissal for false muster. A year or so ago, Tom Lowry posted a bet in _Civil War News_, offering $50 for each authenticated BC. Since it was his money, he set some guidelines. I don’t have the original letter to the editor, but he wanted documentary proof, in government records, that the BC was a duly enlisted soldier. I am guessing based on his $50 prize that Dr. Lowry expected to pay out for a few dozen BCs. And I expected he would have to. To my surprise, and I suspect to Dr. Lowry’s, no one could come up with a genuine BC. Most of the nominees were word of mouth or some Yankees claiming to have seen hundreds of BCs. It seems to me that Dr. Lowry was saying that only those were eligible who were part of the PACS, and recognized by the CS government as African-Americans. In any event, against a hundred, or maybe less, BCs, there were the 186,000 USCTs, almost all of whom were residents of slave states, and, indeed, most were former slaves. Another 15-20,000 African-Americans served in the United States Navy during the Civil War. And there were something on the order of 100,000 white men, residents of the seceded states, who chose to wear Union Blue. I have a scan of the WSJ article and would be glad to post it or, if there is a copyright issue, send it to you and let you decide it you want to allow it to be posted. Thanks for the references, Bob. It’s unfortunate that this debate tends to come down to numbers when there are so many more interesting questions that need to be addressed by historians. The one topic that I am trying to wrap my head around is the way in which the war shaped race relations in camp. The war forced slaves and masters to confront one another in an environment that was unfamiliar to both. That is deserving of serious analysis. I just watched the Bruce Levine lecture you posted a while ago. Very informative, I’ll try to get my hands on his book. Still I’m interested in the Krick article. Even though a few hundred “nonwhite” soldiers does not substantially change the picture of race relations and racial policy during the civil war accepted today, I’d like to know more about those exceptional instances, and if they were in fact, exceptional. Statistically they are uninteresting in the sense that they will not alter our overall understanding of the challenges that a slave-based society faced at war. I have read literally hundreds of Confederate letters and diaries and I have never once come across a reference to black soldiers. Most of my reading into these sources is from the summer of 1864, well after the introduction of black Union soldiers to the battlefield. 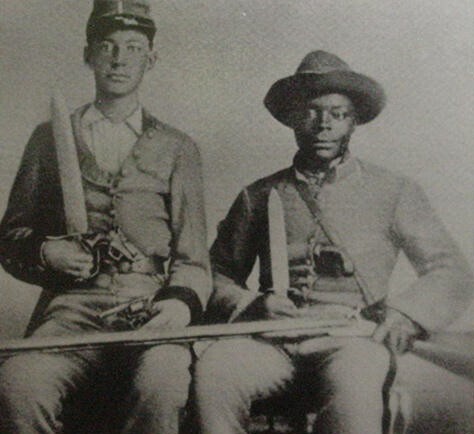 Even after the battle of the Crater, which included a division of USCTs, not one Confederate referenced their own loyal black soldiers. Please let me know if you ever find enlistment papers for such an individual. I think there is some nuance missing from the discussion regarding the complex and various relationships between slaves and slaveholders and the way these relationships may have impacted the attitudes toward Confederate “service” for at least a limited number of enslaved African Americans. Influenced by Kevin’s blog, I’m skeptical about any but the most trivial of military service by blacks in the Confederate army. Yet, I am much less skeptical that in light of complex kinship ties there may have been at least some enslaved blacks who identified with the Confederate cause and served it willingly, although not as soldiers. For example, there were slaveholders who acknowledged informally, and maybe even openly within their family, their blood ties to family slaves who were half-siblings. Is it unreasonable to speculate that some black Americans who knew they were 3/4 white may have identified more with their slaveholder kin than with the “Yankee” invaders, or even with other slaves? I guess my point is that it is presumptive of us, without documentation, to place ourselves in the minds of people from 150 years ago who endured centuries of slavery and assume we know exactly what they thought and their psychology. You’ve made some excellent points re: the importance of kinship ties, which is almost always left out of these discussions. I’m increasingly disturbed by the influx of spurious claims backed with self-referential evidence (if any at all) in intellectual discourse. The other day, the pastor at my church, speaking of the first appearance of a human being in the book of Genesis, slipped in a little comment, “six thousand years ago . . .” I’ve not spoken to my pastor yet, but I’d guess he has latched upon the notion that Adam was created in the year 4004 BC, a notion first promoted by Archbishop James Ussher in the 17th century. Some have told me that such offhand comments don’t matter–but they do, whether they lurk in the shadows of the internet, or in muttered half-phrases, or embedded in a paragraph in a textbook. I’m afraid that we educators lack the spine and patience to stand up and confront falsehoods. Part of this may be because we have a shaky grasp of what “truth” is. It is dangerous to let people have their own set of facts and and create their own truths, especially in the narrative of our nation’s history. Thanks for your efforts. Thanks for the kind words, Phil. Teaching is my way to combat the noise that you reference in your comment. My goal as a teacher is to get as many of my students to a point where they can think for themselves. I don’t mean that in the sense that they can simply form an opinion, but that they can properly analyze evidence and come to a sound conclusion.